There’s a lot of buzz about ‘when’s the best time to post to Facebook?‘ and ‘how do I get my posts seen by more people?‘. The truth is that if you know where the majority of your fans are demographically then you know what time they are likely to be online. People in France are going to be using Facebook at different times than those in America and the same is true with other time zones – make sure you target your audience appropriately. 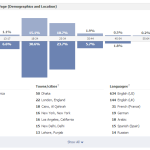 We can tell where our fans are simply by looking at the ‘Likes’ tab in Facebook Insights as you can see in the screenshot to the right. Age also plays a big part of timing your posts. 18-24 year olds tend to be on Facebook longer and much farther into the night than say 35-44 years olds. Targeting times where your fans are going to be online is a good tactic but there are many other factors involved in knowing the best time to post. 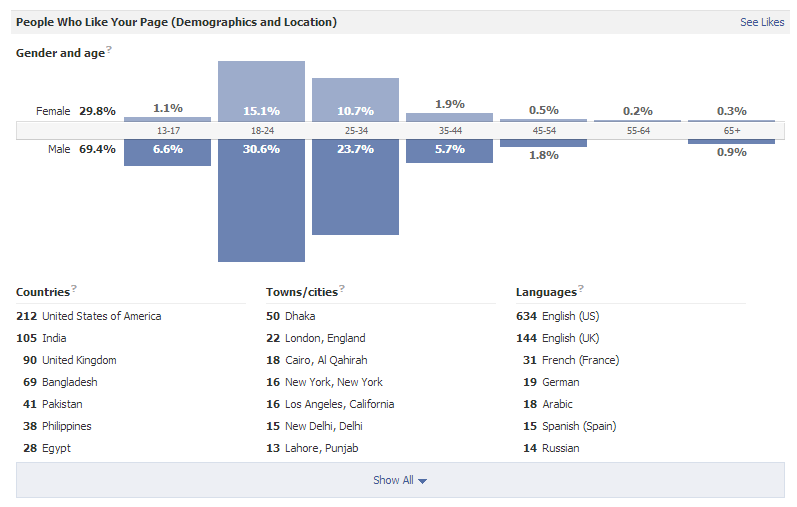 A study was done recently on 1800+ big brand pages on Facebook across may industries and topics. The results show that not only is time a factor but day and industry are also very big factors to consider. If your in the Fashion industry then your best day to post is a Thursday. People might be looking for inspiration on what to wear on a Friday night out or something else entirely but the fact is that Fashion posts do best on a Thursday with Saturday being almost a good. If you’re in the Entertainment industry, like my gaming site and the corresponding game Facebook Page is, then Weekends and early on Monday morning is the best time to post. People want to be entertained on the weekend. I’ve noticed this trend myself, about the same amount of people see my posts during the week but most of my ‘likes’ and comments happen on Saturday nights so I should be posting my best content on a Saturday morning. This following best days to post to Facebook infographic by Linchpin Designs has a few very interesting facts about the use of FB as a whole. For instance a whopping 79% of all interactions with Facebook Pages are ‘likes’ with 15% being comments and shares make up the rest of interactions at just 6%. There’s a few even more insightful facts at the bottom of the infographic. Turns out that posts published at night. between 8PM and 7AM get a 14% higher interaction rate than posts during the rest of the day and pages that post more than 7 times per week see a 25% reduction in interaction that those that post less frequently. Pages that post 1 or 2 times per day get 19% higher interactions and interaction rate at the weekend is 14.5% higher than those throughout the week – despite only 14% of posts being published at the weekend.